Yes, yet another Dance Legend post! The 3 polishes that I'm showing today are from the RIO collection, which consists of 6 polishes in total. They're all glitter toppers in similar colors and shaped/sizes, but I'll tell you more about the other ones below as well. I've swatched them on different colors, to give you an idea of the looks you can create with these, hope that helps! Starting with RIO #1, which happens to be my favorite as well, yay for bright, fun and happy nails! ♥ This polish comes in another version, #5 is the same I think, minus the orange square glitter. Loving this on white! 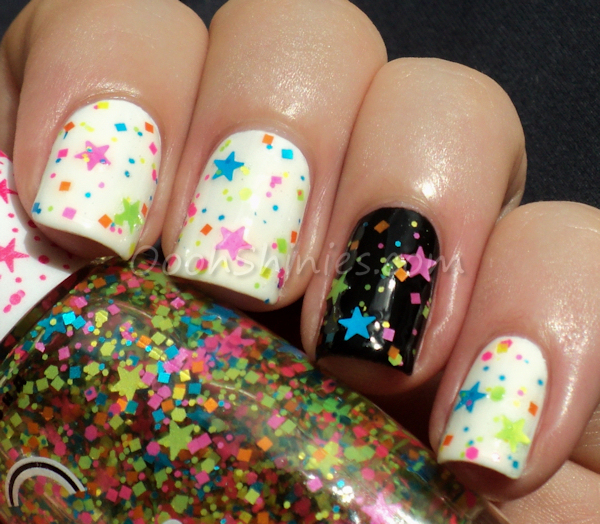 Next is RIO #3, it's the same as the polish above, but then without the star-shaped glitters. As you can see, they work fine on various colors, but I definitely prefer these on white as well! And here they are side by side! Neon & cute, and I think they could be great for adding little accents or a glittery gradient as well. What do you think of these glitters, would you wear them or are they something you'd pass on? Polishes used as basecolors: white = China Glaze Snow, light grey = Essence Got A Secret, dark grey = Essence Pointbreak, black = Essence Black Is Back. You can buy Dance Legend polish on their website, but you can also find them in other webshops, like Hypnotic Polish.